Take a quart of the best Spirit of Sack: 4 ounces of Sarzaperilla: and 2 ounces of China cut ye Sarzaperilla into peices Slice the China and put both these into the Spirit in the pottle botle. Sett the bottle in ye sun and slake it often till ye Spirit become as yellow as gold then cleave it oft into another botle and put to it eight ounces of gum Guiaci beaten to a fine powder which must be done in a stone mortar a little hot and dry shake ye botle often till ye Gum be dissolved all but the drags which will be in five or six days then Cleave it oft into another bottle And put one ounce of Naturall---Balsam of Pern. 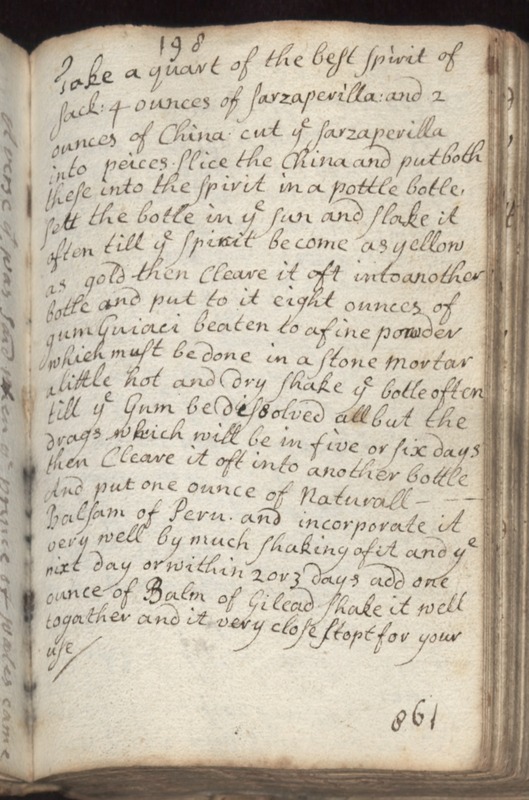 and incorporate it very well by much shaking of it and ye nixt day or within 2 or 3 days add one ounce of Balm of Gilead shake it well togather and it very close stopt for your use.